The Capital Ring is a walking route that loops around London. It is about 78 miles in total if you believe both Walk London and the route book I was following (The Capital Ring by Colin Saunders; ISBN 9781845137861). I do want to believe them, largely because TFL and the Ramblers’ Association think it is shorter. The route is split into 15 stages. Earlier in the year, having moved into a travelcard zone that would allow me to get to them all without extra paying, I decided to try and run each of the stages. To mitigate for my lack of navigation skills and make sure they did not cut too much into the running, I decided to walk each stage first and then attempt to run it back again. In effect, I would end up walking the route clockwise and running it anti-clockwise. I had more than once, in previous years, made the announcement that I would walk the Capital Ring and then completely failed to do so. Obviously the answer was to do it twice and add some running! Below is a description of how I got on. 8/6/2014 – Stage 2 – Falconwood to Grove Park – Grove Park to Falconwood. I’ll admit I started with stage 2 because it was shorter than stage 1. It was a hot day, which is in itself a reminder of how long ago it was now . I wasn’t put off by the whole thing and so I carried on. 15/6/2014 – Stage 1 – Woolwich to Falconwood – Falconwood to Woolwich. Made a minor navigation/reading and comprehension error at the beginning in that I got off the train at Woolwich Docklands and then proceeded to follow the instructions in the book from Woolwich Arsenal. Somewhat amazingly this actually got me to the Capital Ring route, but slightly further along than I was meant to be. I worked out my mistake (after being confused for an embarrassing amount of time), walked from there, ran the whole thing back and then walked the bit that I had missed. The stage had lots to see. It starts by the Thames, goes through some woodland bits and some meadowy bits. There is even a small castle. I can see why they put this stage first for the people actually doing them in order. 28/6/2014 – Stage 5 – Streatham to Wimbledon Park. I’d been at Wimbledon the day before watching Roger Federer putting on a masterclass under the Centre Court Roof. As the mistake the week before meant that I wasn’t really doing things in order anyway, I decided to continue the Wimbledon theme. I was even in range to listen to matches on FM Radio Wimbledon once I got to Wandsworth Common, although the tennis was initially competing with some drum and bass, which if I’m honest didn’t really fit the ambience that well. I didn’t end up running back this time. I’d set off late and I was meeting my Mum and, had I run, I wouldn’t have had time to shower, which probably wouldn’t have been a good thing for either of us. 13/7/2014 – Stage 5 – Streatham to Wimbledon Park – Wimbledon Park to Streatham. Made the decision that for it to count, I had to walk the stage and run it in the other direction on the same day and so that is what I did. 27/07/2014 – Stage 7 – Richmond to Osterley Lock – Osterley to Richmond. Having completed this stage in both directions I tweeted about it and Walk London, who are responsible for the route, tweeted back sounding enthusiastic about the idea. I replied that I intended to finish the whole thing in the next couple of months. This was possibly a little optimistic. In the next couple of months I completed one further stage. 16/08/2014 – Stage 4 – Crystal Palace to Streatham – Streatham to Crystal Palace. I used to live pretty much at the start of this stage and so I’d walked it before a few times. You would have thought that this would mean that I wouldn’t mess up the navigation on this one. You would be wrong. A wrong turning in one of the residential bits led to a bit of head scratching and some swearing. 28/09/2014 – Stage 13 – Stoke Newington to Hackney Wick – Hackney Wick to Stoke Newington. A lot of this stage followed the Lee Navigation Towpath. It turns out that even I can follow a towpath without getting lost. The Olympic Stadium came into view at the end of the walk – good inspiration for the run back. There had clearly been a colour run in the Olympic Park that day as I came across several paint spattered runners on my way. 5/10/2014 – Stage 15 – Beckton District Park to Woolwich – Woolwich to Beckton District Park. This stage was fun. I got to run through the Woolwich Foot Tunnel, which with its strip lighting and tiled walls would have been quite creepy if there hadn’t been other people down there. I even ran up the stairs rather than taking the lift. After completing the stage in both directions, I took the Cable Car on my way home. 12/10/2014 – Stage 14 – Hackney Wick to Beckton District Park – Beckton District Park to Hackney Wick. Part of this stage went along the Greenway, which was the route into the Olympic Park if you got off at West Ham during the games and so it had happy memories. Even without the encouragement of Games Makers I really enjoyed the run back. This stage went along the Parkland Walk for a bit, which follows the route of an old railway. There is an abandoned station at Crouch End complete with platforms. Some of the later bits of the stage were a bit muddy and it all felt pleasingly off road. On one of the on road (well, on pavement) bits in Stoke Newington, I saw a Banksy. I got up before dawn to travel to this start of this stage. I’m not sure if this demonstrates a commitment to the challenge or just a commitment to getting to the drinks with friends that were planned for the afternoon. It was a beauty of a stage. Autumn really was the time to do one of the woodland stages. I even saw a heron. I tried to take a picture of it, but it moved. 8/11/2014 – Stage 8 – Osterley Lock to Greenford – Greenford to Osterley Lock. It was a bit rainy, but I felt like a pro because I’d remembered to bring a freezer bag so the book didn’t get wet. I’d set off a bit late and so I actually ended up running for some bits in the walking direction because I was worried about not finishing in the light. That I decided to do this was testament to new found confidence in my fitness. Obviously this could have shown up lack my navigation skills and backfired disastrously, but I reasoned that even I could probably follow a canal towpath. I saw another heron. I tried to take a picture of it, but it moved. 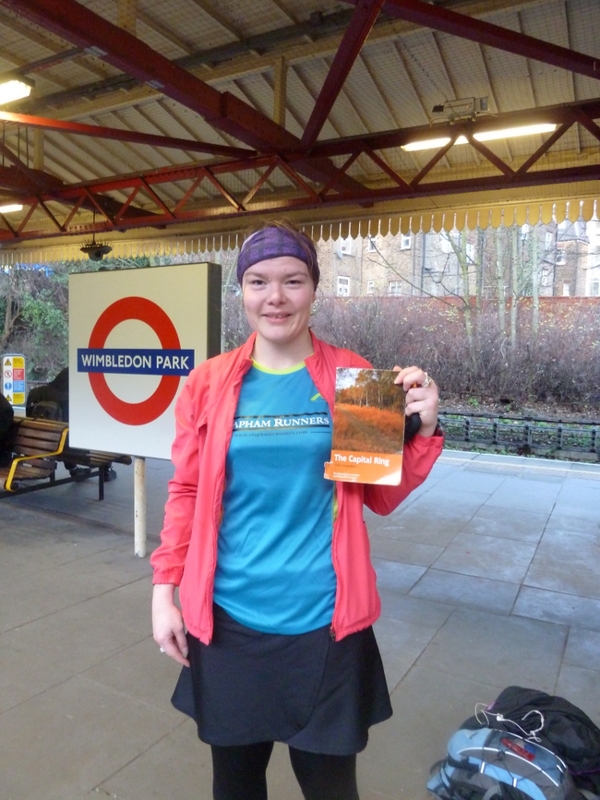 22/11/2014 – Stage 9 – Greenford to South Kenton. I walked this stage, but didn’t run it back as the weather was horrible, the route was muddy and by the end of the walk my trainers and socks were soaked and audibly squelching. I was as miserable as the weather. The tube seemed like the better option and so I took it. 29/11/2014 – Stage 9 – Greenford to South Kenton (again) – South Kenton to Greenford. Sticking to my earlier and completely arbitrary decision that it only counted if I both walked the stage and ran it on the same day, I walked the stage again and, this time, managed to run it back again. It was a much better experience in the dry. The views that the book mentioned were actually visible! I also managed to avoid submerging my feet in a muddy bog. This was one of the hillier sections of the Capital Ring – there was even a trig point. 07/12/2014 – Stage 10 – North Kenton to Hendon Park – Hendon Park to North Kenton. I’d tried walking this stage a couple of years previously and abandoned the walk having navigated so badly that I ended up walking up the same hill twice (the view did look awfully familiar…). This time I was obviously intending to go up the same hill twice, but I was also intending to complete the whole route in both directions. I am pleased so say I managed it. That said, Fryent Country Park felt a bit like a big waterlogged field with confusing hedges (they all look the same and so don’t always help navigation), the residential bits were quite boring. Also my knee was twinging at the end. I’ll be honest, this wasn’t my favourite and was a bit of a slog. 14/ 12/2014 – Stage 3 – Grove Park to Crystal Palace Park – Crystal Palace Park to Grove Park. I ended up doing this stage on the Sunday having slept in on Saturday (nothing at all to do with the fact my work Christmas do was on Friday…). The only problem with this was a lack of Sunday service trains and this meant that getting to and from Grove Park involved a series of buses. I set off reasonably early (it was the longest stage and I wanted to make sure I would finish it in the light) and it was pretty frosty and cold when I was waiting in between buses in my running gear. I had layers enough for walking in and running in, but I was pretty cold when not moving. That I could only find one of my gloves that morning did not help matters. I did wonder at that point whether the whole endeavour was a good idea. The stage itself was actually pretty enjoyable, not least because it did not rain and, while some of the park bits were muddy, I was never in danger of losing my shoes like in the previous stages. The final stage. I really wanted to finish this challenge in 2014 (another arbitrary rule I made up to make things more difficult for myself). As a result, I became unnecessarily doom laden about the whole thing before the start of this stage. Would I be able to do it? Was I getting a cold? Was my knee twinging? Anyway, I made it to the start. The start was Wimbledon Park, which is where I had camped in the summer in the Wimbledon queue. The park looks a bit empty to me without tents. The walk went without a hitch. I was pleased to see deer in Richmond Park and they turned out to be less camera shy than herons! I did make a wrong turning during the running bit (well, it had become traditional…). After I realised the second muddy path that I tried was also wrong. Luckily the third path was a charm. This was a good thing because having a tantrum in the woods on my own would not be a dignified way to end the challenge. I made it out in the light and back to Wimbledon Park. About six months after I had started I had finished. I really enjoyed the Capital Ring. I think the challenge was a really good thing for me. London has a lot of different open spaces and many of them are lovely and green. ← Club Colours have arrived!